The most popular quote in the book, these are the words that Johnny utters as he lays dying. Stay Gold is a reference to the poem by Robert Frost that Ponyboy read to Johnny while the pair hid out in the abandoned church. As the poem says, “Nothing gold can stay,” meaning that all good things must eventually end. In reality, Johnny is urging Ponyboy to stay innocent – not to further the violence or to lose himself in the hoodlum way of life that they had slowly become accustomed to. 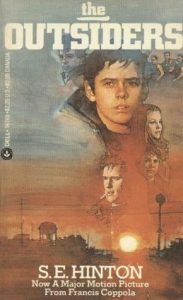 As the youngest of the greasers, Ponyboy has long since been the most innocent of the group, despite the rest of the group feeling that they needed to protect Johnny – in reality, Johnny was committed to protecting Ponyboy. It’s okay… We aren’t in the same class. Just don’t forget that some of us watch the sunset too. These are the words that Ponyboy says to Cherry after he and Two-Bit and Johnny spend time with her and her friend, Marcia at the theatre. Ponyboy indicates that the sunset bridges the gap between the Socs and the greasers. Noting that despite their differences in lifestyle, attitude and economic status, they are a part of the same world, and share the same sun. Greasers will still be greaser and Socs will still be Socs. Sometimes I think it’s the ones in the middle that are really the lucky stiffs. This is what Randy proclaims to Ponyboy as he explains that he will not be attending the rumble. These words speak to the importance of the futility of the Soc-greaser violence. In stating that Socs will always be Socs and that greasers will always be greasers, he is suggesting that it would be impossible for members of with group to rise above their status. We couldn’t get along without him. We needed Johnny as much as he needed the gang. And for the same reason. As Ponyboy sits beside a dying Johnny, he thinks of how much the group relies on each other. Johnny is young, passive and poor – so he is an easy target for the Socs, hence why he needs the greasers for protection. Ponyboy has realized that they need him too – he gives them purpose, someone to watch over, they exist to stand up for the underdog.